Don't need cream in sauce (recipe becomes Steak a la moutarde), still smooth and flavorful. Use full sauce recipe quantities even if doing two steaks. As thousands of wines from around the globe enter the marketplace and the American palate continues to adopt flavors from a range of cultures, the task of pairing wine and food becomes increasingly complicated. No longer is the choice simply red or white, or wines from California, France, or Italy. The typical shopper today has access to wines from those regions plus South Africa, Chile, Argentina, New Zealand, and Australia. If that isn't confusing enough, Asian, Latin American, and Creole dishes might find their way onto the same table. Perfect Pairings, by well-known Master Sommelier and respected restaurant industry veteran Evan Goldstein, provides straightforward, practical advice for choosing the right bottle for each meal. 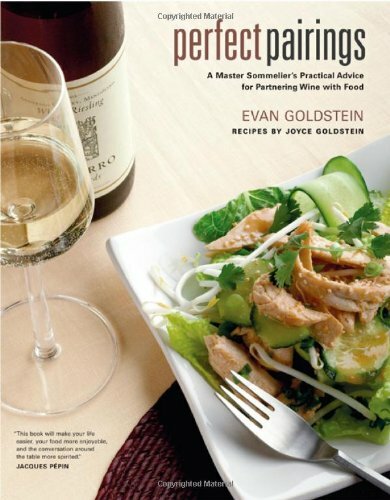 The quintessential resource for matching wine and food, this book includes 58 companion recipes developed by celebrated chef Joyce Goldstein that showcase each type of wine. Inspired yet down-to-earth, this book will make your life easier, your food more enjoyable, and the conversation around the table more spirited. The best wine and food pairing book ever written.